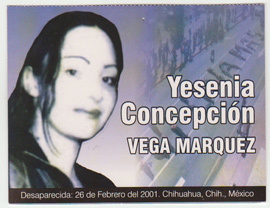 Yesenia Concepcion Vega Marquez, disappeared 26th February 2001. Since 1993, more than 400 women have been brutally raped, mutilated and murdered in the Mexican border town of Ciudad Juárez in the region of Chihuahua. Hundreds more have simply disappeared. Images of many of them, by British artists as diverse as Maggi Hambling, Paula Rego and street artist Swoon, have been commissioned and brought together by Tamsyn Challenger for an exhibition Shoreditch, in what the artist hopes will be both an extraordinary artwork, and a permanent statement against violence toward women everywhere. The exhibition is the culmination of a five year project, inspired originally, says Challenger, by an Amnesty International report into the ‘femicide’ in Ciudad Juarez. She traveled to the region and met some of the mothers of the missing and murdered women for a Radio 4 Women’s Hour programme. One of the mothers laid postcards of the young women in her hands, and Challenger was overwhelmed. visually everything was bright for me, It was a heightened moment. I looked at the postcard, this three-colour print, so poorly produced - inevitably, because there’s no money - you can’t see noses, sometimes you can’t see the eyes, they’re really blurry, they’re reproduced and reproduced from a photocopy and the face was just lost. It was so sad. And that’s when the idea sparked in my mind, I think, and a part of me was eager to bring that person back, to confront society”. Challenger says she has tried to link up the images with the artist, such as matching initials, or ages, or a particular photograph that is very bright and relates to an artist who uses such colours. Portrait artist Julie Bennett has contributed an image of ‘Elena’ who has been missing since 1997; despite her mother’s ceaseless campaigning, Mexican police closed the case in 2006. Working from a grainy, blurred photo provided by the girl’s mother, she has transformed her subject, saying of the heightened colours and glossy, almost glamorous pose of her portrait: “I wanted this to be a celebration of Elena. I didn’t want you to feel sorry for her, but rather to make her iconic, like a celebrity. I’ve pushed the colours to bring positivity to the painting”. She too sees the exhibition as part of a universal stand against violence against women.